Be the first to share your favorite memory, photo or story of Joseph "Joey" . This memorial page is dedicated for family, friends and future generations to celebrate the life of their loved one. Joseph Edwin Stringer, 34, was born in Downey, California on March 26, 1983. He was raised in Watonga, Oklahoma where he graduated high school in 2001. 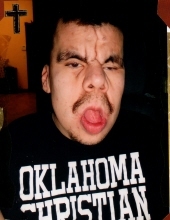 In 2013, he moved to Piedmont, Oklahoma with his parents. He was received in the arms of his Heavenly Father on February 26, 2018. Joseph was known to many as Joey, and to four special people in his life, he was known as Uncle JoJo. Joey was born with Cerebral Palsy and set out from day one to prove that doctors were not the ones in control of his fate. When the doctors would provide diagnosis and time tables, Joey always prevailed well beyond their expectations. He required constant attention from his loved ones to do everyday tasks that most take for granted. For Joey’s family, these were not “tasks” that had to be done, but rather just a way of life, the things that we did out of love, not necessity. For nearly 35 years, his unrelenting mother and his father never left his side. Joey was not a handicapped child or a child with disabilities, he was special, he was our son, our brother, and our Uncle JoJo. Joey loved being around family and was very excited when we would all get together. He loved being an Uncle to his nieces and nephews, and enjoyed watching cartoons with them, having them jump in bed with him, and letting them read books and play with him. When his meal was something that he did not favor, Uncle Joey never turned away if it were his nieces and nephews that were feeding him. Above all, Joey was the greatest teacher to this family. He was able to implant the greatest values of life upon our hearts…unselfishness, unconditional love, humility, and sacrifice. Joey was one of the few people on this Earth that always impacted other people in a positive way. He made us better, and he will be greatly missed. Joey is survived by his parents, Thomas and Socorro Stringer of the home, brother Marco and wife Tonya Stringer, brother Daniel and wife Ashley Stringer, and his four special playmates, his nieces and nephews, Jordyn, Blake, Ashlyn and Dylan. In lieu of flowers or condolences, the family would ask to honor Joey’s life by unselfishly giving your time and talents to do something for someone that will let that someone know they are loved. Funeral services will be held on Saturday, March 3rd at 2:00pm at the Piedmont United Methodist Church, Interment will follow at the St. Patrick Cemetery in Edmond under the direction of Groves~McNeil Funeral Service in Piedmont. To send flowers or a remembrance gift to the family of Joseph "Joey" Edwin Stringer, please visit our Tribute Store. "Email Address" would like to share the life celebration of Joseph "Joey" Edwin Stringer. Click on the "link" to go to share a favorite memory or leave a condolence message for the family.